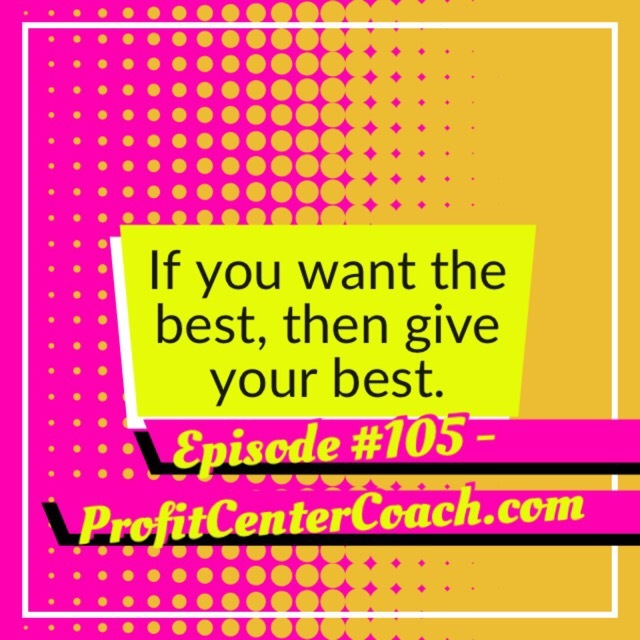 If you want the best, then give your best… that’s cool, but does it have to be the best? Hummm…. Well, it depends on your definition of the word “best”. If it’s your definition, then YES it has to be the best. If it’s someone else’s definition of “best”, then nope, it doesn’t necessarily need to be the best. Let’s just look at what I wrote. Do you think there’s an English professor on the planet that would say what I just wrote was “the best”? Dang, if you’re paying $40,000 a year, I sure hope not! But here’s the scoop, I don’t care. OK… rewind that. Let’s be honest, I do care. I’m actually jealous of people that write beautifully – but much like my Japanese skills – I’m conversant at writing/blogging and I focus on getting my point across… FYI, I “invented” the word conversant to describe my Japanese skills the day I ordered a plain chicken sandwich at McDonalds in Akita, Japan, by pointing at the photo of the chicken sandwich and saying, in Japanese, “no white and no green please” AND I received a plain chicken sandwich! I conversated. Happiest day of my life! Until the next day when I stumbled across an Oreo Cookie ice cream bar. Blogging is “totally RAD” (Real Authentic Dude) – PS: the 80’s called and I’m not giving back my “valley girl speak” – sheeh, I love the 80’s! Here’s the deal… you need to write so your audience gets your personality. You need to be real and authentic. This is all about you communicating with your customers. They want to know YOU. Blogging is just a form of communicating with your audience where you need to mesh your message and personality. It’s sharing your Subject Matter Expert information with your customers… because they need the information! But doing it in your own unique authentic way. It’s easy to start a blog because you simply sign up. It’s difficult to continue a blog because you have to do it consistently. But it’s terrifying letting go of all of the “proper” English rules that confine us. I remember sitting at a desk K-12, day after day, year after year, listening to a teacher drone on and on, about nouns, verbs, adjectives, and not having a clue what the heck she/he was talking about. And to make it worse? She/he would turn back from the chalk board and say (with screeching horror music playing in background)… “now write a 3 paragraphs on blah blah blah” and I wondered how I would ever get anything in my head on paper using all of these noun/verb rules that I didn’t understand. I’ve said this before. If you are using social media marketing as a tool for your small business then what you are doing is creating information for your customers. Information that they need! IF someone has a problem with the way you communicate they are not your ideal customer. Your ideal customer is one that meshes with your value system, personality, and ethics. Sure, you’ll have people outside of that curve (and you’ll hate working with them), but ultimately… if someone hates the way you write your blog… you don’t want to work with them. There are plenty of people that will gravitate toward your blog and your message and your personality. These are your ideal customers. Write for them. Share your knowledge. But ultimately, give “your” best for them. 3- If you have a blog and you write consistently. Let go!